Fantasy football owners are starting to really question what is going on this season. Andy Dalton is the number one player in standard scoring leagues just like we all expected. Sitting right behind him is rookie running back Devonta Freeman of Atlanta, who has 90 points in his last three weeks. Tyrod Taylor and Carson Palmer are tied for the fourth-highest scoring quarterbacks in the league. Even Josh McCown is coming off a 30-plus point performance – and yes, I lost to a team that started Josh McCown this week. 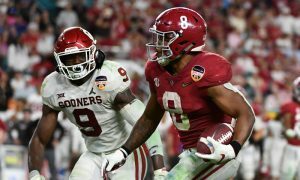 This season hasn’t made any sense and zero predictions are coming true. With all that in mind, the former Alabama stars are still making headlines as they strengthen their careers in 2015. T.J. Yeldon got his first career touchdown while Julio Jones lucked into six fantasy points with a tough fumble recovery in the endzone to get back on track for fantasy owners. 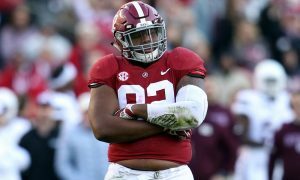 Amari Cooper and Eddie Lacy could never get going in week five while Mark Ingram and the Saints struggled on the road. Let’s get to week six! Julio Jones is back on top of the list after a weird performance against Washington last Sunday. The Falcons are really starting to rely on Freeman and their running game. Jones caught just half of his 10 targets for 67 yards through the air. His touchdown came on a loose ball that Jones was aware enough to fall on in the endzone. Jones will be going on the road for Thursday Night Football in New Orleans against their division rivals. Jones is still dealing with a nagging injury to his hamstring and that may be the reason for his lack of targets in the last two weeks. 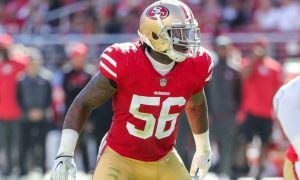 He may need to be a bigger part of the gameplan this week in a tough game against a Saints defense that has allowed just four touchdowns to wide receivers this year. They give up the 11th-least amount of fantasy points to wide receivers but they haven’t faced anyone like Jones yet. This week, I have Jones getting 10 more targets while catching eight of them for 97 yards. I am not predicting a touchdown this year though as Devonta Freeman has proven me wrong three weeks in a row. 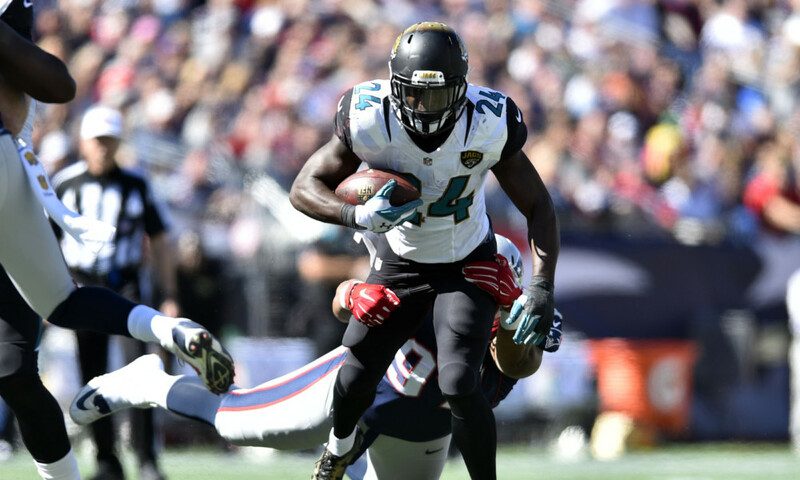 T.J. Yeldon finished second in fantasy points in week five thanks to his 4-yard touchdown catch in the third quarter. 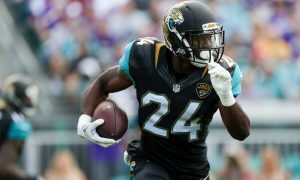 Yeldon only ran for a season-low 32 yards on 11 carries but finished with 12 total fantasy points. Yeldon has stayed pretty consistent for his fantasy owners so far this season but still needs a couple of breakout performances to be in the conservation as one of the league’s top backs. This week, Jacksonville will host a Houston team that is coming off their two worst performances of the season. The Texans gave up a 37 point performance to Devonta Freeman and a 15 point performance to veteran Frank Gore. 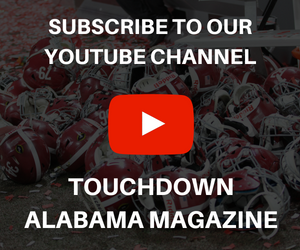 Yeldon could see a season-high in touches this week and a 100-yard performance isn’t out of reach. I have Yeldon at 14 fantasy points this week, with the help of of 80 total offensive yards and (finally) a rushing touchdown. Mark Ingram averaged nearly five yards per carry against the Eagles but the offense was focused around the passing game with the Saints facing a large deficit for most of the game. 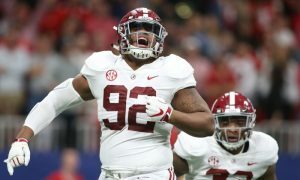 Ingram only saw three targets as C.J. Spiller dominated most of the passing downs out of the backfield. Ingram is clearly the workhorse for the running game but his success may go hand in hand with the success of the Saints. Ingram and the Saints host the Falcons, who have given up less than 60 yards to running backs in each of their last two games. However, in the Falcons last road trip, they gave up 46 total fantasy points to the running backs of Dallas. Ingram hasn’t scored since week three but expect him to get back this week. I have him finishing with 70 rushing yards and touchdown but not much through the air, as his targets have started to dwindle. Amari Cooper got just four targets against a strong Denver defense but he caught all four for 47 yards. He also had one carry on a sweep but only managed two yards. It was clear the Raiders were trying to get the ball to their top playmaker but the Broncos were too good and knew how to shut down the Oakland offense. This week, Cooper should see more freedom against no defense on the team’s bye week. Eddie Lacy had his fourth straight week in single-digit fantasy points, which is starting to frustrate his fantasy owners. He is just the 30th best running back in standard-scoring leagues after a 27 yard performance against the Rams last weekend. This week is the perfect week to get back on track though, facing the league’s worst defense against the run. The Packers host the Chargers who have given an average of 24 fantasy points per week to opposing running backs. Eddie Lacy could end up being the workhorse in one of this week’s best games. I have Lacy getting back on track with 120 total yards of offense and a touchdown to finish with 18 fantasy points.